[252 Pages Report] The top 10 high voltage and medium voltage products market is expected to grow from an estimated USD 214.99 Billion in 2016 to USD 320.53 Billion by 2021. 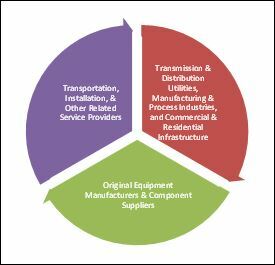 Factors such as modernization of existing power grids, increased investments in renewable energy, adoption of smart grid technology and growth of offshore wind farms are driving the market worldwide. For company profiles in the report, 2015 has been used as the base year. Wherever recent (2015) data was unavailable, the previous year’s (2014) data has been included. This research study involved extensive usage of secondary sources, directories, and databases (such as Hoovers, Bloomberg, Businessweek, and Factiva) to identify and collect information, useful for this technical, market-oriented, and commercial study of top 10 high voltage and medium voltage products. The points mentioned below explain the research methodology applied in making this report. * Core competencies of the companies are captured in terms of their key developments, SWOT analysis, and key strategies adopted by them to sustain their position in the market. 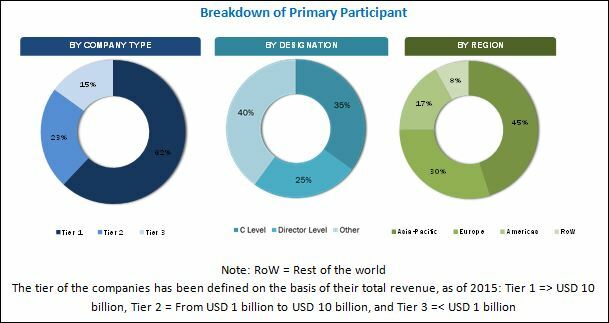 After arriving at the overall market size, the total market has been split into several segments and subsegments. The figure given below shows the breakdown of the primaries on the basis of company type, designation, and region, conducted during the research study. 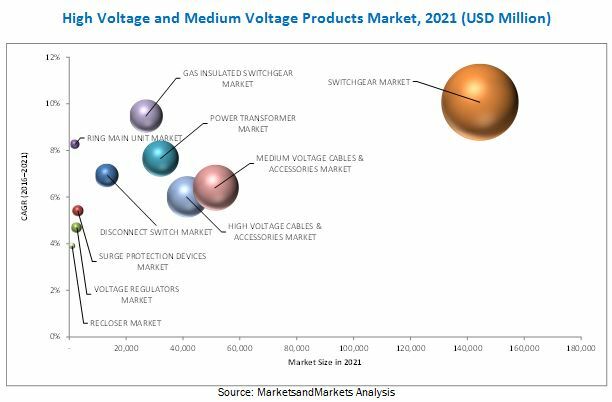 The top 10 high voltage and medium voltage products market starts with the manufacturing of equipment such as switchgears, transformers, and cables, among others. ABB Ltd. (Switzerland), General Electric Company (U.S.), and Siemens AG (Germany), among others are the leading equipment and service providers. The final stage covers application in the end-use industries such as transmission & distribution utilities, manufacturing & process industries, and commercial & residential infrastructure, among others. The top 10 high voltage and medium voltage products market is expected to grow from an estimated USD 214.99 Billion in 2016 to USD 320.53 Billion by 2021. Factors such as modernization of existing power grids, increased investments in renewable energy, adoption of smart grid technology and growth of offshore wind farms are driving the market globally. The report segments the top 10 high voltage and medium voltage products market on the basis of high voltage products, medium voltage products and region. The high voltage products include power transformer, switchgear, high voltage cables & accessories and gas insulated switchgear. The medium voltage products include disconnect switch, recloser, ring main unit, surge protection devices, voltage regulator and medium voltage cables & accessories. In terms of market, by type, of high voltage product, the switchgear market held the largest market size in 2015. Factors such as power plant modernization and refurbishment, continued construction and economic development activities (industrial and commercial) across the globe, coupled with rising population resulting in increasing demand for electricity and subsequent investments in new transmission & distribution infrastructure would necessitate growth in the market for switchgears. In this report, the top 10 high voltage and medium voltage products market has been analyzed with respect to the following regions, namely, Asia-Pacific, and Europe, among other regions. In the Asia-Pacific region, the market growth of top 10 high voltage and medium voltage products can be attributed to factors such as increasing grid investments, especially in developing economies such as China, India, and other South East Asian countries, that focus on rural electrification, transmission & distribution network expansion, large scale industrialization, growing urban population, among others. Factors such as adoption of smart grid and substation automation projects also aids the market growth. The demand for top 10 high voltage and medium voltage products can be directly linked to the development of generation, transmission and distribution infrastructure. The demand for these products is also driven by growth in renewable power generation and upgradation of old power infrastructure. However, factors such as fluctuating raw material prices and increasing competition from unorganized sector could restrain the market growth. On the other hand, adoption of smart grid technology and expanding cross-border electricity trade, represent promising growth opportunities for the market. Some of the leading players in the top 10 high voltage and medium voltage products market include ABB Ltd. (Switzerland), Eaton Corporation Plc (Ireland), General Electric Company (U.S.), Schneider Electric SE (France) and Siemens AG (Germany), among others. Contracts and agreements was the most common strategy adopted by the top players in the market, constituting more than fifty percent of the total development share. It was followed by new product launches, mergers & acquisitions, and expansions, respectively. 6.9 Hyundai Heavy Industries Co., Ltd.